The deception behind California’s Marine Life Protection Act. Some may have heard of the Marine Life Protection Act (MLPA), an initiative passed in the state of California which was touted as being a law that would protect whales and other marine life from the harm that human beings can cause. The goal was to create protected zones so as to maintain sustainable fishing while allowing marine life to have a steady food supply. Fishing is an important economic element of California, so the initiative was seen as helping both people and whales. But the truth of the matter is much different. The MLPA initiative was in fact sponsored by some of the biggest enemies to marine health that exist in the world today, such as oil companies and coastal real estate developers. If the act was supposed to create zones where human interference was disallowed, why would these sorts of industries be involved in passing it? As it turns out, the initiative protects these areas, but only from fishing and nothing else. This gives free reign to oil companies, military who wish to do testing, energy companies looking to use the ocean as a source of power and several other industries that don’t involve fishing. In essence, the act preserves regions of the marine environment from fishers so that others can exploit them without competition. This hardly protects whales and other marine life the way people would like. 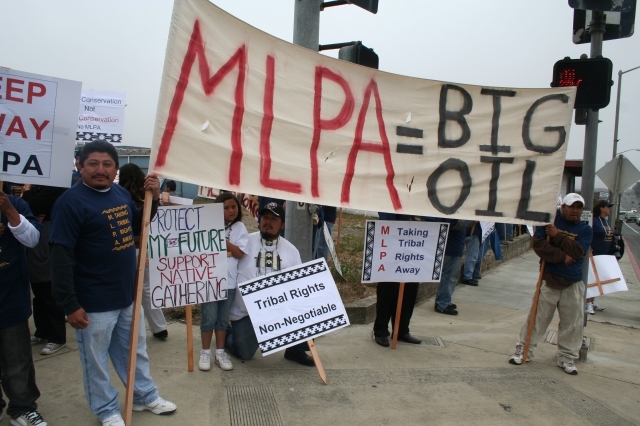 In fact, in a rare act of coming together, fishermen, tribal members and environmentalists are all on the same side regarding their disapproval of the MLPA. It does no good to save whales from fishermen taking all their food if they simply end up in danger from oil drilling or seismic testing. It’s another case of people using their power to abuse the system and masking it as an environmental cause. If we don’t begin to implement some system of full-disclosure, these sorts of shady laws will continue and whales and other ocean-dwellers will suffer because of our ignorance. There is no excuse to allow big business to disguise their dealings while labeling it as environmental. In my opinion, it should be illegal and these groups should be prosecuted for legal deception. Until we have honest lawmaking regarding environmental policies, they will not function properly and whale populations will continue to be in danger.